The period between Thanksgiving and now has been a hectic one, to say the least. Because of a big mid-January deadline, I was working most days between Christmas and New Year's, and I hunkered down to work even harder from practically the first day of 2019. I was even, for the first half of this month, on pace to bill 3,000 hours this year (a formidable number, even to some of the hardest-working biglaw associates), and that was significantly busier than I had ever been before. Thankfully, things have calmed down now, and should hopefully stay that way for at least a few more weeks! I'm still trying to suss out whether I think working like that, particularly if it's for longer periods and/or on a more regular basis, would have the consistent, noticeable effect of increasing my spending or shopping. Work-related stress and long hours do make me more likely to rely on delivery food and a daily latte, and at some point it could drive K and I to finally make the decision to hire cleaning help, so it definitely affects my spending in all kinds of areas outside of shopping. And of course, I've often confessed that I'm prone to online window-shopping when I'm stressed out, which can easily lead to buying more things, so it definitely has some effect on my shopping as well. At the same time, as some of my peers in the industry have noted, there is definitely a point at which one might be working so much that it has a sharply depressive effect on spending and shopping, if there simply isn't enough time to do anything but wake up, go to work, go home, and fall asleep promptly, rinse and repeat (including on the weekends sometimes), at which point even the limited mental energy required to browse an online shop and order something may be a little too much. I'd say that my recent busy period at the office helped with not buying clothing this month, but it wasn't for lack of trying. As I mentioned a few weeks ago, I ordered some clothes, but none of them worked. And after that, I even ordered and tried on one more extremely extravagant thing, a deeply discounted. but still very pricey, Mansur Gavriel braided cashmere sweater in dark gray (also available in blue), which was, let's just say, proportioned for a woman closer to six feet than to my actual height (5'3''), and also ran bigger than expected all around. For next month, I may still be tempted by all the cozy sweaters out there, especially if the end of season clearance discounts get any better. The Vince funnel-neck sweater on my wish list seems to be fully sold out in my size everywhere, but maybe I'll see something vaguely similar from another brand. Oh, and although I'm typically not a shoe person, I ended up in an elevator with a stylish woman wearing those Gucci loafers that the Sam Edelman ones I like so much are, er, essentially imitating, and I must say, the contrast is dramatic. The Gucci loafers definitely come off much better in the comparison, as they probably quite naturally should, for obvious cost, materials, and craftsmanship-related reasons. Even though I'm perfectly happy with the Sam Edelman loafers and expect them to last quite a while with occasional reheeling, and even though the Gucci ones are far, far more expensive than any other pair of shoes I've ever tried on, much less bought, I would be lying if I said I wasn't still daydreaming a bit about the Gucci loafers now, they're so sleek and beautiful. 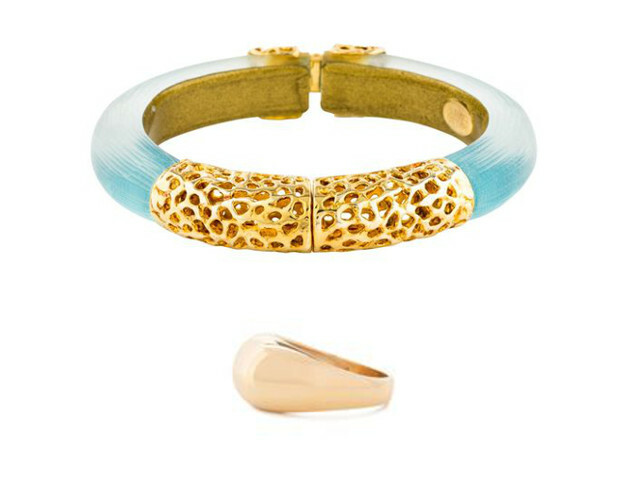 Alexis Bittar Hinged Lucite Bangle - $108.28* - (I haven't seen this exact design elsewhere, but somewhat similar new ones can be found here and here; or used ones here and here.) This wasn't on my actual shopping list, so I've technically broken the only actual rule I set for my shopping this year. I'd been tracking it for quite some time on another Pinterest board (the one I send to K with Christmas gift ideas), however, so I gave myself a pass. I only rarely like Alexis Bittar designs, his larger, more statement-making pieces are generally a little edgier than my usual style, but his lucite pieces, many of which are textured to resemble stone, can be intriguing. Separately from that, I've been interested in jade bangles, both more classic, plain ones and ones with metal accents (like from Choo Yilin). But I don't dare buy one myself. I don't know anything about jade, nor even about what a "good" bangle should cost. Also, I've never regularly worn a bracelet of that thickness or weight, so who knows, maybe I'd hate wearing one. For whatever reason (lucite and jade are, obviously, not at all alike), I became convinced that an Alexis Bittar bangle, in green or blue-green, would be a good way to try out this general look. I hunted through eBay and TheRealReal for quite some time to find ones I thought had the right look. This was one of my favorites. It's gorgeous, and is another one of those pieces I can't help but admire throughout the day. I'm still not used to wearing a bracelet of this thickness on a regular basis, though, it does feel like it gets a little bit in the way when I'm typing at my computer. Mejuri Dome Ring - $63.35* - I'd been thinking about this ring, or something like it, for months now, and this also came straight from my current shopping list, so I have no qualms about having made this purchase. I was going to feel compelled to try this, or a design very much like it, at some point, whether it happened now or later. Also, I went to the Mejuri showroom to make sure I got the right size, and that the design looked good on my finger. Alas, despite my diligence in seeing this item in person before I ordered it (something I almost never do), I think I may still have chosen wrong. This purchase may yet turn out to be an error in judgment after all. I'm just not used to wearing rings, I hadn't worn a single one out of the house since shortly before I started law school, so it feels fussy to me to have this on. The size 9 that fit correctly on my index finger at the showroom is now a little too big most days. (The weather's been quite cold, maybe my fingers will swell more normally throughout the day once it's warmer?) The sizing issue is making the ring even more fussy. **Indicates that the price included sales tax and/or shipping charges. One thing I'm realizing, when it comes to my rather loose set of rules and guidelines for shopping this year (the "put everything through one consolidated wish list" rule is the only particularly concrete one), is that I may not have had a clear sense of what my larger goal actually was, except for there to be "less" shopping than the year before. Sounds simple enough, but I may not even have known what "less" was supposed to mean, exactly. It begs the question, "less" of what? It isn't really about "less" total spending, though I'd be pleased if it turned out that way. (I know that sounds absurdly extravagant, but I trust myself to manage my overall finances well, and it's always been easy enough for me to cut from other budget categories to make room if I overindulge a bit in shopping.) I don't generally count total individual items bought in each category, though I have the data to go back and calculate it, and I did find the totals a bit sobering when I looked back at the past four years, so it is sort of about "less" of that. It definitely meant "less" purchases that were not as good an idea as I originally thought, in which case my track record for the year is already not great. Was it also supposed to mean "less" time spent thinking about shopping and "less" packages from online shopping going back and forth? It probably should mean both those things, but I'm not sure I'm ready to commit to that yet. How's your shopping year looking so far? Is anyone else also working on some kind of goal to shop less this year? How's that going so far? Also, does anyone else have as much trouble with ring sizing for fashion jewelry as I do? Way back in the day, when I was in college and was into the statement cocktail ring trend (anyone remember those YSL "Arty" rings? I thought some of the colors were gorgeous, but could never dream of owning one), none of the standard ring sizes quite worked for my index finger. A size 7 was definitely too small, but it was sometimes hard to find size 8s, much less the size 9s that may be closer to the right fit.